The final tallies were clear. Of those residents, 274 were over age 21; 263 were minors. There were seven recorded African-Americans, all male, all over age 21. There were 98 foreigners, 91 male and 90 over age 21. And by far the majority of the people were enumerated as domesticated Indians: 1249 males, 1041 females, 1474 over age 21 and 816 under age 21. The people were dramatically outnumbered by the animals: 5164 beef cattle, 904 cows, 262 mules, 1767 horses, 726 hogs, 1580 sheep, 246 goats and 856 poultry. Now… back to that 1852 tally. 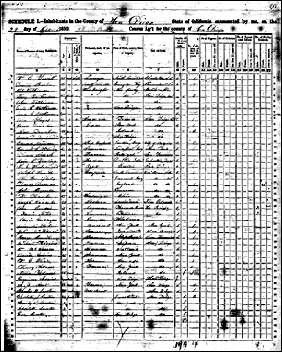 Of course, the greatest utility for the census is in finding someone who either wasn’t found or wasn’t yet there in time for the 1850 U.S. census. Even when a family was enumerated on the federal census in 1850, you may find something new or different by 1852. Case in point, the family of Abel Watkinson. The bottom line: this 1852 census is a terrific resource for early California research, and even if you find your folks in 1850, it’s critical to go on and see how and if they were recorded in 1852. And for San Diego County, don’t overlook the work of the San Diego Genealogical Society in producing the 89-page 1852 Census, San Diego County, California, complete with maps and index.11 You can find it in the holdings of the San Diego Genealogical Society in the San Diego Heritage collection at the Central Library in downtown San Diego. You are correct as to how the column is headed on that census. However, I am not an 1852 enumerator. I am a 21st century blogger. And I try to consider the views and sensitivities of 21st century readers. The term “Negroes” isn’t used much today, and I made a conscious choice not to use it. Great post (as usual)!Thank you so much for mentioning our society! I’ll see you this weekend. Paul Hawthorne, Historian, SDGS. Looking forward to seeing you and everyone else in San Diego Saturday!